First, last, and always, make sure your horse is sound. That’s the warning that any decent equine professional gives before practically anything we do. It’s the common disclaimer; we almost skim over it as a formality before getting on to the training issues. In other words, we get complacent to chronic pain messages because it’s easier to train sometimes than it is to track down some nebulous pain. We should know better. It’s the first question every rider should ask from the ground every day. Is my horse sound? Learning to read pain takes perception; it’s complicated in the beginning. It isn’t that we don’t care. We might not be sure and that means a vet call. We usually have a plan that day. Even if it’s a trail ride, we don’t want to cancel. If it’s something that involves money or hauling or inconveniencing other people, we usually think it’s not so bad and go ahead. We should do better. There’s also a disclaimer that we should hear from horses –first, last and always. They are prey animals. Their instinct is so interwoven into their behavior and personality, that it’s inseparable. Prey animals aren’t forthcoming about pain. If your horse is stoic, he’ll grit his teeth, sometimes literally, and keep trudging on acting like he’s fine, until it’s too late. If your horse is more reactive than stoic, he’ll act aggressively hoping that bravado will pass for strength. They aren’t okay. It’s common sense if you’re a horse. Prey animals hide their pain to survive. They are born knowing that the wolves kill the slow, lame members of the herd. Showing weakness, even within the herd, could mean less access to hay. It isn’t good or bad; it’s nature’s plan that the fit survive. We throw a wrench into that cycle when we domesticate animals so, at the very least, we must listen much more carefully. Most of us can read enough herd dynamics to know that shy old gelding might need to eat separately. We proudly list each horse’s position in the herd as an affirmation that we know our horses. As if it’s some kind of equine astrology and now that we know the horse is a Sagittarius that explains everything. I’ve been teaching calming signals for the last few years as a way of understanding small messages from our horses before they become huge issues. It’s fun to have a non-verbal conversation with a horse. I always give the reminder about soundness but often we’d rather have a conversation about challenges, like standing still at the mounting block. What if the mounting block represents the beginning of what hurts and your horse resists it because he’s smart? Not a training issue at all. It’s about now that we have to ask the hard question: Is it my lousy hands or is he in pain for another reason? How is his saddle fit? If you aren’t having that checked at the very least once a year, things have changed and he feels it. Maybe he has a rib out or his withers are a bit jammed and he needs a chiropractic adjustment. Maybe he’s in his teens and you have repressed the idea that his back might be getting arthritic. I don’t blame people. Checking for soundness is an affirmation of our horse’s mortality. Ick. Lameness can be hard to diagnose, even with radiographs and ultrasound. And I think there are pains that horses feel that we just can’t find, even with the best help. Vet science is still an art. If lameness weren’t complicated enough, the existence of ulcers can distract us from questions of soundness. Ulcers are a huge issue for horses. Between 60% and 90% of horses have them, and worse, they sometimes mask lameness issues. It isn’t uncommon to treat a horse for ulcers and then perhaps find a stifle problem underneath them. A tense poll, elevated head. Ears back or one ear back and one forward. Tight muscles around the eye. Exposed white of the eye. Intense stare or partially closed eyes. You’re right. Those are symptoms so common. Some are even contradictory. We see them all the time, it’s easy to be complacent about them. They could be calming signals to ask you to cue quieter or that they need a moment to think. Or they could be signs of pain. It’s that experience where you type a couple of your own symptoms into Google to try to self-diagnose, only to find you could have one of twenty life-threatening issues. How many times do we think we’re just depressed but it turns out that depression is a symptom of twenty other terrifying life-threatening issues? And suddenly playing with calming signals is less fun. If you have a stoic horse, then cut that minimal fun in half. Can we ever trust what a stoic horse relates? Are so many nebulous and negative unknowns looming large enough now that you doubt everything you used to think you knew? Perfect. You’re not supposed to think you know everything. Instead, work on having an open mind and good intention. We must be willing to see “bad behavior” as a message and not a training issue. Be willing to listen, but also be willing to hear things we don’t want to hear. Even embrace the idea that our horses might be in pain. I don’t mean that we all become equine hypochondriacs but how can we help them if we don’t almost welcome the idea? Positive training, asking a horse to volunteer, is more than kind. It has a distinct advantage for the horse. He gets what he wants from a leader. He gets to be heard when he hurts. Great article, Anna! Excellent. Way too often see signs of pain where others see only stubbornness or bad behavior. Thank you! I want to share this with a horse trainingbgroup if that’s ok. I can’t wait to take a workshop/clinic with you. Even if I fly in from somewhere! I always enjoy your information transfer! Sharon, I keep trying to make it to Oregon, I think that’s where you are… Thanks for the kind words. As you’ve said, pain signs are hard to interpret sometimes, so I’m curious about additional cues. Will a horse in pain breathe differently? Will he still buck and play? Will he run, tail high? Which is not to say that if a horse does these he’s totally fine, but in combination it might be meaningful? Yes, they breathe differently. But the hard thing about reading calming signals is that you can’t take one out of context. It has to be the big picture and they do contradict sometimes, because of this instinct to hide pain. Bottom line: yes, it’s complicated. Thanks for a great article. Too often, we’re so in “hurry mode”, we overlook the obvious. I am looking forward to your clinic in the Spring at From The Mother Farm-just waiting to hear about sing-ups. Yay, see you then. Thanks Susan. I am hoping to get to that one too! I am from Vermont but was just visiting my daughter in Tacoma and decided to try a lesson with Nancy at FTMF. Great lesson and great farm! I wish everyone could really hear what you are saying here, Anna. I have had more people tell me to work through “stuff” with my OTTB. I try to keep following my gut and every time I have suggested to my vet a possible illness/problem, he has had it. I think it helps to spend a lot of time with your horse and know how they are at various times, not just when you are leading them in from the pasture to ride them, saddling and riding them. Not everyone has the ability to do that if they are boarding elsewhere. So then its even more important to give them the benefit of doubt. They do deserve the benefit of the doubt. There have been horses who were found to be sound, but I just always knew somehow there was pain… not acomfortable feeling. Good luck, Kim. Excellent – this means a lot to me, you know we work with horses from various backgrounds and are healing so much pain… and they all need exercise! That balancing act becomes something we’re teaching to people whether we meant to or not!! Last night I was watching Godless on Netflix and there is a Buckskin that the sheriff rides who is so obviously in pain it’s hard to watch (lame on left front). I caught myself clenching my jaw for his sake and watching every step. He looks okay from a distance, but at a walk it’s like a slap in the face. Not that Hollywood has ever been (ahem) self-aware, but I was wondering how they couldn’t see it? I’m thinking that this translates to real life in your statements “we should know better […] we should do better”. Sometimes being an advocate (the horse is always first) requires saying when you see something wrong (with a horse, or a dog, or a kid). Your popularity with people may decrease, but the horse, or the dog, or the kid, may benefit in the long run. Indeed. On the high side, that rider who always jerked and kicked his horse got trashed by the hero… there was at least a conversation in the series about training horses. Not great, but a start. I have had both non horse and horse people, watch my old OTTB race across the pasture like there is nothing wrong with him. Laugh at his antics, and ask “Why don’t you ride him?” I call him over, and then they see his knee. And ankles. Old “racing jewelry” All that galloping around like he’s 2? Will cost him later. He’s on everything but bute, which I keep on hand for the REALLY bad days. He eats, drinks, makes me spend a bit of time cleaning his stall. Hardly ever leaves a piece of hay of grain in his stall or bucket. But he’s going to be 22. “If it wasn’t for his knee” is another one I hear from the people that know us. Because it is “us” Not me. Not him. But “us” He is in other wise great shape. Good weight. Still “with” me. But he does have “that knee” And he earned his retirement. He’s pasture sound. But I know that the day, when that is even too much for us to handle, is coming. I have owned mares, and ponies. That’s just as bad as saying “kids will be kids” or “boys will be boys” Pay attention. There’s no need for a horse to be sore like that. Call the vet, farrier. Or a more experienced horse person. Listen to your horse. They will tell you when something isnt right. From your lips to the ears of every horse person, every where, please. You can count on me to nag endlessly. Thank you, Darcy. I live in that forgiveness every day. So needed to read this today. Have a 10 year old mare who has become incredibly hard in the mouth, actually is blocking her whole body. Saddle is ok, my vet has been over her from head to toe 3 times, we have x rayed most of her joints including her neck and done bloods for metabolic diseases etc. Nothing really has come up. I know something is hurting somewhere as she now puts her head in the air when she sees the bridle coming. I gave her 6 weeks off recently which made it worse. She is beautiful and talented but maybe I should make peace with the fact that she is hurting somewhere and stop trying to fix her so that I can ride her again. Has she been checked for ulcers?? But I do take your point. I don’t know if it’s time to give up or not, but I do know she’s telling the truth. Good luck, Annoesjka. Maybe she doesn’t like the bit or the bit is hurting her. Have you tried riding her in a bitless bridle or halter? Horses get headaches, tight hamstrings & so much more so I use a lot of massage therapy & especially when we’re unable to pin point the exact issue in our competition horses. Research & find a good one in your area, that only uses their hands. No tools or devices. Great topic. Great replies. Thanks to Anna and all! Thank you for the article. Just to add mores clues to discomfort. Watch how your horse stands in the field, Does he/she stand and rest on all four legs? Watch if they can rollover or roll at all. Also when a horse stands after rolling they should shake. A sound healthy horse will not rest the same hind leg or any hind leg when resting all the time, they all shake after rolling and stand the majority of time on all four legs in a rectangle, an evenly distributed stance. Low head position, twisted tails, dragging toes, toe first landing. We all need to watch, so hard to be a good steward for our best friends. Molly I agree and again, these are tendencies. There are always exceptions to the rule. If you are questioning, call a good vet. Thanks for commenting, Molly. Thanks for spreading your wonderful approach to horses, Anna! You’re welcome, I appreciate the vote of confidence. I’ve read that a calming signal for a horse is to look away; but why does my horse look out into the arena and away from me after we are done riding and I dismount? I can’t guess when I can’t see the actual horse, so I don’t know. Are you standing close to his head? I try to learn as much bodywork as possible for the last five years as well as trim my own horses. I have found it really helps with the little things like a rib or pastern our, a shoulder or femur rotated, it takes not much time to go over my horses regularly and I get to know them better, how soft or hard the muscle feels, how warm the body feels, how they respond to touch. Trimming regularly and having them balanced correctly has helped them tremendously. I spend as much time if not more on trimming and bodywork as on groundwork and riding, I love it. It seems harder sometimes to help ones own horse in pain than another persons horse, there is something about the close connection that makes it easy to see what is wrong but much harder to “fix” , maybe because one is so emotionally invested? Claudia, it’s always harder with our own, always. 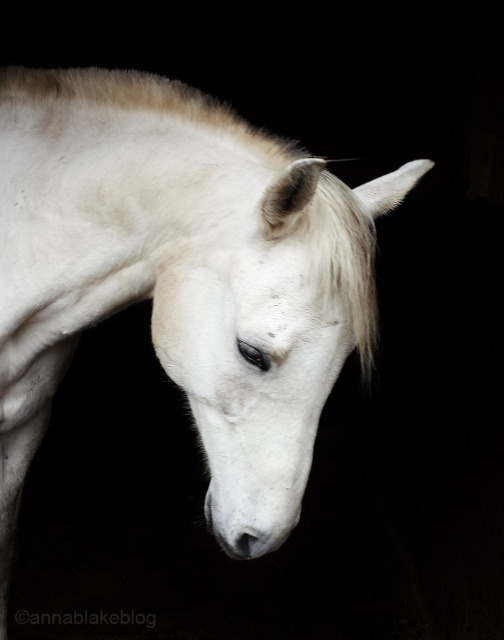 And the more I’m around horses, the more I think pain is a part of life to them, as it is us, but with less emotion. All the trimming and bodywork in the world won’t make a horse 5 years old again. We can do our best, but there is always another thing. And their mental make-up is just so different than ours; we don’t understand them as much as we think we do. Bottom line: they don’t hold a grudge if we have good intention. Perhaps horses’ best trait. Soundness is always a day to day, work in progress. It has to be good enough. Thanks for commenting, Claudia. I just recently found your blog and have spent the whole evening reading about calming signals. I feel like I suddenly understand a bit more about my past interactions with my four-year-old gelding, and I’m so very excited and curious to move forward with these newfound insights in mind. Looking back, I think that what I’ve picked up on is the tense poll and eyes, partially closed eyes, and tense nostrils/lips. I’m going to observe a bit more and hopefully collect some “hard data” to present to the vet. Thank you for giving me the language to describe what I am seeing! Oh, do keep watching. Pain is sometimes hard to diagnose, and it could certainly be gastric. Ulcers are so common… good luck going forward and thanks for the great comment. Your horse says thank you, too. Ulcers have crossed my mind, but he has been on free choice hay and 24/7 turnout with friends all his life. I know that does not rule out ulcers and I will mention it to the vet. He is giving me the feeling it’s possibly stifle related, though. Especially after hanging out with him today. In any case, back to the vet it is! Speaking of today: I successfully kept my hands entirely off his face! The only face touching was done by his nose in my face. I am sure he’d thank YOU if he could! Sometimes it’s like peeling an onion, to find out. Good job with your hands, though! !